Starting at a young age, Bryce has always had a special connection to speed. Living down the road from a bicycle shop and seeing kids ride around the neighborhood, he took a keen interest in going fast – no matter how dangerous. At the age of 10, thanks to friends of the shop, Bryce was introduced to Bicycle Motocross (BMX) and started competing in St. Louis. 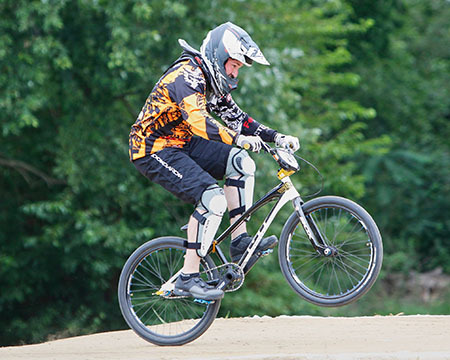 BMX, which became popular in the 1970s, is a form of bicycle racing that takes place on a dirt track and features numerous obstacles and jumps competitors must tackle in the shortest amount of time. Fast forward to 2017 and Bryce can still be found competing. In fact, he recently won the Missouri State Championship for his age division. This win is familiar territory as Bryce has won several state and regional championships, along with placing in the top 10 nationally. As for his next goal, Bryce says he would like to win the Regional Championships in 2018.